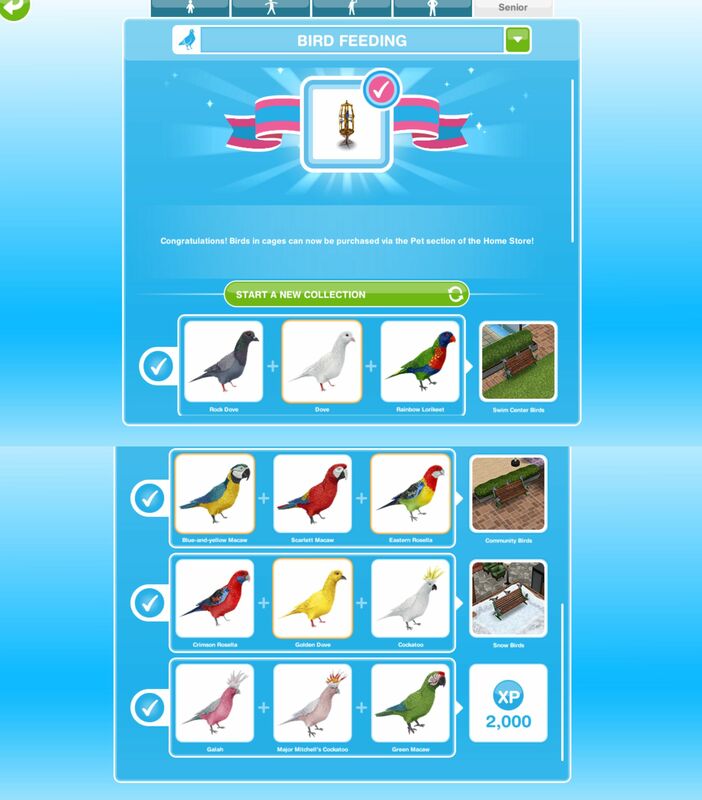 After the time has passed come back and click the exclamation mark above your sims head to find one of the bird collectibles in that row. You still level up in this hobby but the hobby level up percentage isn’t important as the bird collectibles don’t unlock depending on your level, when you finish a row of bird collectibles you will unlock the ability to find the birds in the next row. I just have to say that I love that you respond to all the comments, regardless of the language they’re in. My sims freeplay seems to have a bug. I completed the park and swim center birds to unlock the community center ones, but the bench is not there. So I used the lucky spin and unlocked the snow park bench. That one is there. So I am missing the community center one. Do you know why this could be? I’m sorry I don’t know why it isn’t working, have you definitely found all the birds you need to unlock it? I have unlocked all the birds from the park and the pool center. The snow park bench still won’t unlock. Is there a bug ?? Hi, I finished up collecting all of the birds, and now I can’t find the prize (parrot in cage). Is this in the inventory somewhere? When I go to the “pets” it shows it costs 10 LP although the first one should be for free. The first one should be free, maybe they have changed it since the update have you looked in the pets section of the inventory? By the way, I love your posts! I always come here whenever I need help 🙂 Thank you! Thank you 🙂 I’m glad I could help! Wow, I didn’t know you are Chinese. 🙂 I love your site! It’s the best Sims Freeplay guide out there! Thanks for all your help! i finish it today at the time! is this the last quest ? Please help! I completed the bird feeding quest awhile back (before in stitches quest). strange, have you completed the bird feeding quest? have you completed the bird feeding quest yet? Just wanted 2 say thx 4 this blog!! It’s really helped me a lot!! you have to be at the community center to find the birds at the community center. When you unlock all the benches you still have to go to the specific place to find all 3 birds there, but when you unlock the bench for your homes you can then find all the birds at one bench, if you pick the 10 minute option you will find the park birds on that bench, 1 hour will be the second row and so on. Hint, try and find a neighbour with a bird feeding bench, these are 2* so you can do all the tasks quicker ie 11 hours not 12 hours at snow park. And they are all birds in 1 place. Just working towards my bench myself now. Can this hobby be done at a friends house? I completed the hobby and the parrot isn’t showing up in the pets section! If it’s a glitch what do I do? Hi I just started this quest, and it says, search a tree at a house for birds? Am I looking for a birdhouse somewhere? no this hobby doesn’t have a time limit fortunately! Hi. I just started the hobby with one of my seniors (I’ve completed the Life Dreams & Legacies quest) but the only bench available is the one at the park that takes 10 minutes. And I have no time for my seniors to keep doing this every 10 minutes to complete their Life Dream. Why aren’t the benches at the snow park or the swin center showing anymore? I’m glad I could help and you’re welcome! Where do you feed birds at the snow park ? At the bench in front of the cabin at the snow park.